settings_site: for information that applies across your site like responsible officer, short name etc. The templates work together with your Site ID to retrieve and include standard elements from the central store, such as the explore bar, banner, metadata, styles and footer. Content management system (CMS) developers, please see the instructions for upgrading a CMS from version 3. Save the files on your webserver, in folder/s of your choice. Note that settings_site and config must be in the same folder and settings_features and features must be in the same folder. Make a copy of page, rename it to index.php and save it in the root folder for your website. This will become your homepage. Edit index.php and view the source code. Update anything with *** markers. Save your changes and preview the webpage. 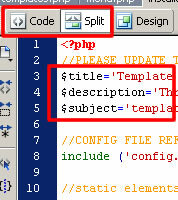 Edit menu.php and ensure that the new webpage is on the site menu. Refer to the web style guide for styling options including adding features and RSS feeds. 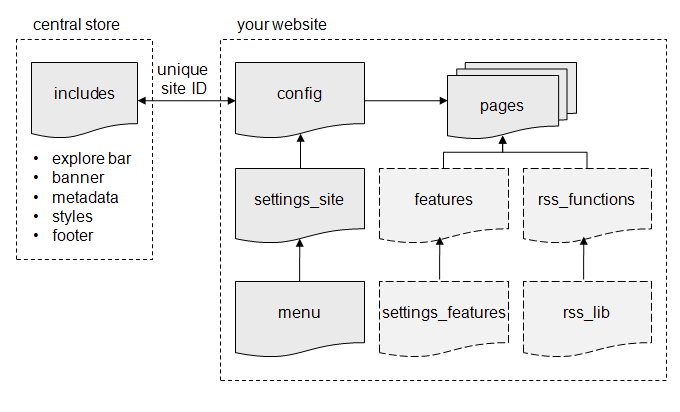 You can repeat the above process to create more webpages. When naming files, be descriptive of the file contents and avoid using spaces in the filename. If you must have spacing, instead use a hyphen (-) or an underscore (_). Dreamweaver can be used to view and edit the template files.